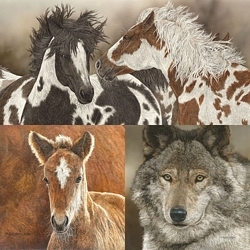 Long ago, millions of wild horses roamed the many terrains of North America. Loss of ever-shrinking habitat, incessant gathers, and deliberate annihilation have reduced wild horse numbers from millions to thousands. In Judy’s tribute to the remaining free, wild horses, a gray stallion gazes far away, hoping to catch a glimpse of a small band or two.